Delicious homemade chicken nuggets that skipped the deep-fryer! Ever wondered why chicken nuggets at McDonalds always have the same 4 shape? They are called the boot, the bell, the ball and the bone. Well, if you really want to know – Jamie Oliver has a nice video about that on YouTube. To keep this description less disgusting, let’s just say they are somewhat formed into shape by machinery… Nuggets pressed into form… Yeah that sounds very natural to me. Why would you ever eat pressed meat if you can make much tastier and healthier chicken nuggets at home? You decide what goes into your nuggets and by skipping the deep-fryer you make this dish even (slightly) healthier! I often make these nuggets when I’m invited for brunch or am giving a party where I want to serve some finger food. They are really addictive and I can promise you that there will not be a single one left after just a few hours! If you are somewhat scared of breading chicken yourself I can put you at ease – it’s really not that difficult! The cautious (and better) one: Arrange 3 plates, 1 with the wet marinated chicken, 1 with dry flour, 1 empty one to place the coated chicken on. Only use your left hand to put the wet chicken pieces into the flour and only coat your chicken pieces with your right hand. Transfer the coated chicken pieces also with your right hand. Place the coated chicken pieces on the third plate in a single layer. The quick and dirty one: Fill a zip-lock bag with a decent amount of flour that will be enough to coat all the chicken pieces. Properly drain the marinade from the chicken, put the pieces into the zip-lock bag, seal the bag and shake carefully to coat all the chicken pieces. By marinating the chicken overnight in garlic, sambal and honey it picks up a really nice spicy but sweet flavor. As some of the marinade will stick to the chicken when you bread them, things turn out even more delicious! I am using ketjap manis again in this recipe, because it is simply my favorite soy sauce! 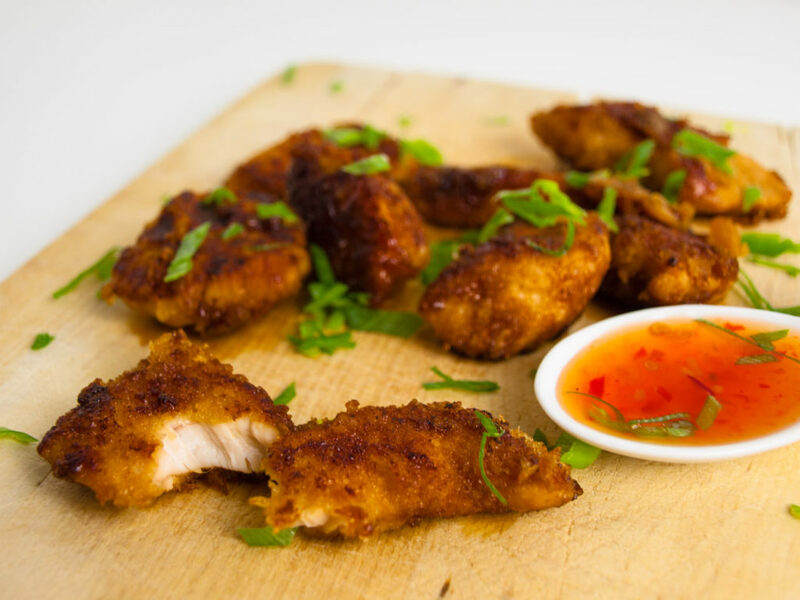 This thick sweet Indonesian soy sauce is sticky and syrupy which works really well with these nuggets. But enough talking for now! Come on, let’s go– there is no time to waste! We have chicken nuggets to make! Real meat in a crunchy and sticky jacket! Chop the garlic very fine. Cut the chicken into even pieces (about 2-3cm). Take a large zip-lock bag and add the honey, the garlic, 2 tablespoons of ketjap manis, 2 teaspoons of brown sugar, 2 tablespoons of sunflower oil and mix well. Add the chicken pieces to the bag and seal the bag, trying to remove as much air as possible. Wrangle the bag around a bit with your hands to make sure every single piece of chicken is coated. Let the chicken rest in the fridge for a few hours, ideally overnight! Discard the marinade, but obviously not the chicken. Arrange 3 plates. Put the slightly drained marinated chicken on the first plate. Pour some flour on the second plate (use a deep plate for easier coating). Use your left hand to put a chicken piece into the flour, now use your right hand coat the chicken piece with the flour and place the coated chicken on the third plate in a single layer. Heat a large frying pan on high heat. Add 2 tablespoons of oil to the pan and add half the chicken nuggets in a single layer. Make sure the chicken does not stick together and is browned on all side. This should take about 3-4 minutes. Sprinkle 3 teaspoons of brown sugar into the pan and add 1 tablespoon of ketjap manis. Stir carefully for 1-2 minute to coat the nuggets evenly and to let the ketjap evaporate. You will have sticky dark brown nuggets. Transfer the cooked nuggets onto a plate layered with kitchen towel. Make sure they are in a single layer to prevent them from getting soggy. Repeat this whole process with the second half of the chicken nuggets. Serve these tasty treats warm or cold alongside other delicious finger food delights! Let me know what you think about these tasty nuggets in the comments below! Do you agree that these are better than the one from the company with the golden arches? Do you dip your nuggets in sauce? Oh, sweet-chili-sauce is really nice with these! But they are also perfect without… Let me know how you enjoyed these! Next Post The perfect Mojito!